Increases well-being. Want to fill your life with happiness and energy? Meditation increases your psychological functions and improves your sense of well-being. Improves focus. Research shows that meditation improves cognition. It also increases your ability to perform tasks requiring focus. Improves relationships. Want to strengthen your relationships? Meditation improves your ability to pick up how others are feeling. It increases your emotional stability, making you less influenced by negative people in your life. Improves memory. Research shows that meditation improves your ability to memorize, store and consolidate new information. Improve decisions. Studies have found that meditation helps you make better decisions by improving the function of your brain’s decision-making centers. Reduces stress. Meditation is known for its ability to reduce stress and anxiety. One study revealed that it literally shrinks the density of brain tissue associated with anxiety and worrying. Overcome addictions. One of the most awesome effects of meditation is that it can help you overcome powerful addictions. 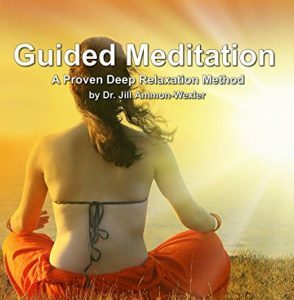 GUIDED MEDITATION: A Long-Proven Deep Relaxation Method. Over 45 years of research have produced evidence of something meditators have claimed for centuries – meditation physically changes the brain, allowing long-term meditators to achieve remarkably high levels of awareness and consciousness. This collection generates neuroplasticity – actual changes in your brain’s physical structure and operation. Spoken relaxation session by Dr. Jill that supports vision and guidance for creative success. Inspiration to help you discover your true creative passion and put it to work. Opens the gateway between Alpha and Theta brainwaves, yielding deeper spontaneous creative insights. Focused in 7.83Hz – the Schumann Resonance known as Earth’s heat beat. Amazing creative insights can occur. Alpha brainwave audio with embedded spoken messages by Dr. Jill. Supports and encourages creativity.